The last time I did a 1-day-1-mask experiment, I was completely converted. After six days of daily sheet masks, my skin was so plumped, hydrated, and radiant. So now that the holidays are over, I’ve embarked on another sheet mask detox, and this time around is no exception. I’m seriously loving this 1-day-1-mask thing. The only thing that keeps me from doing it every day is I’m afraid of plateauing on the skin boost I get every time I sheet mask for five to seven days straight. This cupro mask comes folded into itself (no disposable layer needed) and features an essence that’s more like a lotion, full of rich, creamy milk protein and oak tree sap. It feels luxe and rich and clings to the face amazingly. After 25 minutes, I still see that the cheek area is still wet with essence. It takes forever to pat it in because of the thicker texture of the cream essence — I actually have to do a swirl-pat-swirl-pat thing just to get it to absorb. I finally give up and walk over to my vanity, and surprisingly by the time I get there, the essence has absorbed significantly, enough that I didn’t have to pat anymore and could just move on to my serum steps. I will say, though, the finish is quite sticky (a little less than the J.One Jelly Pack), so for those of you who hate sticky, this may be a problem. For me (and many Koreans), sticky is not a problem, since I wear makeup primer before my foundation. Also, to me, sticky feels like an extra layer of protection for my skin, so I don’t mind it. If you don’t like sticky, wear the mask at night before you sleep. But perhaps the main reason why I love this mask? 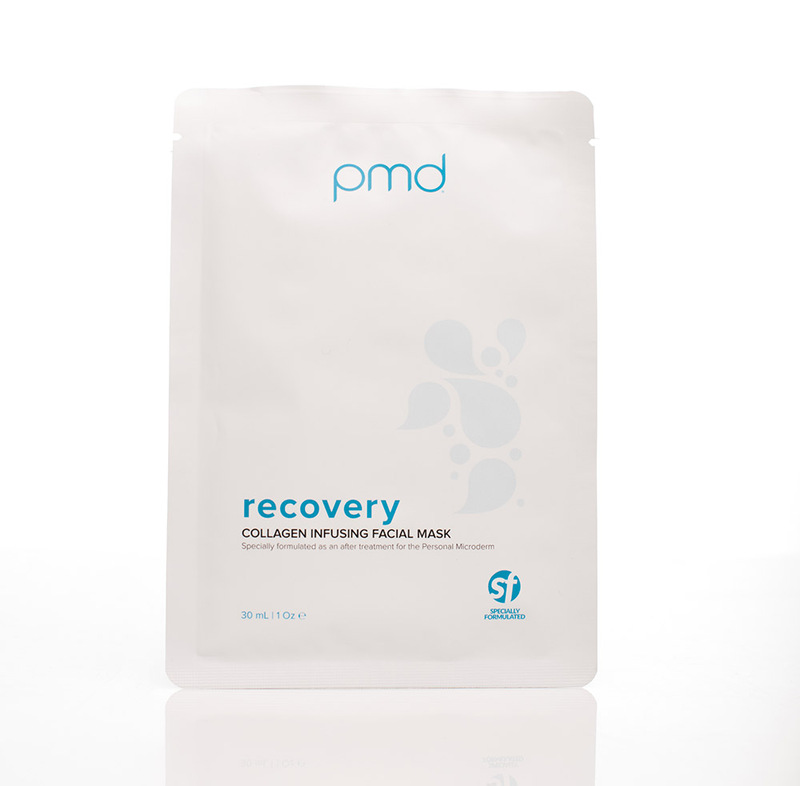 Not only did this mask leave me feeling hydrated all day, that evening, as I was double cleansing my face, I kept massaging my skin because it felt incredibly, abnormally soft. It’s something I’d never felt before. WOW. Bonus: No pilling, no parabens, no PEGs. $7 for one at Glow Recipe. I really like this mask. It’s made to be used after a microderm treatment (or their at-home Personal Microderm), but I’m going to use it anytime, anywhere. 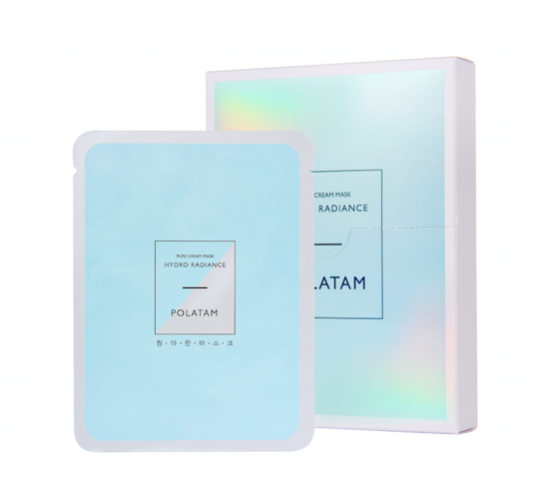 It’s a super thin sheet mask that’s easy to apply, thanks to the double layer of protective sheets. Remove the thicker perforated one first, then apply the mask to the face and remove the thin, pliable blue layer next. There’s a good amount of clear essence, full of glycerin, algin, chlorphenesin, olive fruit oil, mannitol, and sodium hyaluronate. Collagen is the third to last ingredient in the relatively short ingredient list, but there’s some debate as to whether collagen in skin care products can actually penetrate the skin anyway. It doesn’t matter that much to me because it’s a great sheet mask with other skin-loving ingredients. After 20 minutes, the mask has definitely dried a bit, though still damp. After I remove it, I pat in the remaining essence, which feels bouncy and a little sticky on my skin. I’m surprised that it absorbs so quickly and even more surprised that it leaves my skin matte, not dewy (or should I say wet) like most sheet masks. Of course that doesn’t mean my face doesn’t feel hydrated — my skin feels hydrated, plumped, and soft. And I love the matte finish — it’s like all the essence has sunk into my skin. Bonus: It didn’t pill as I applied the rest of my skin care. This is definitely a sheet mask I’d buy again. 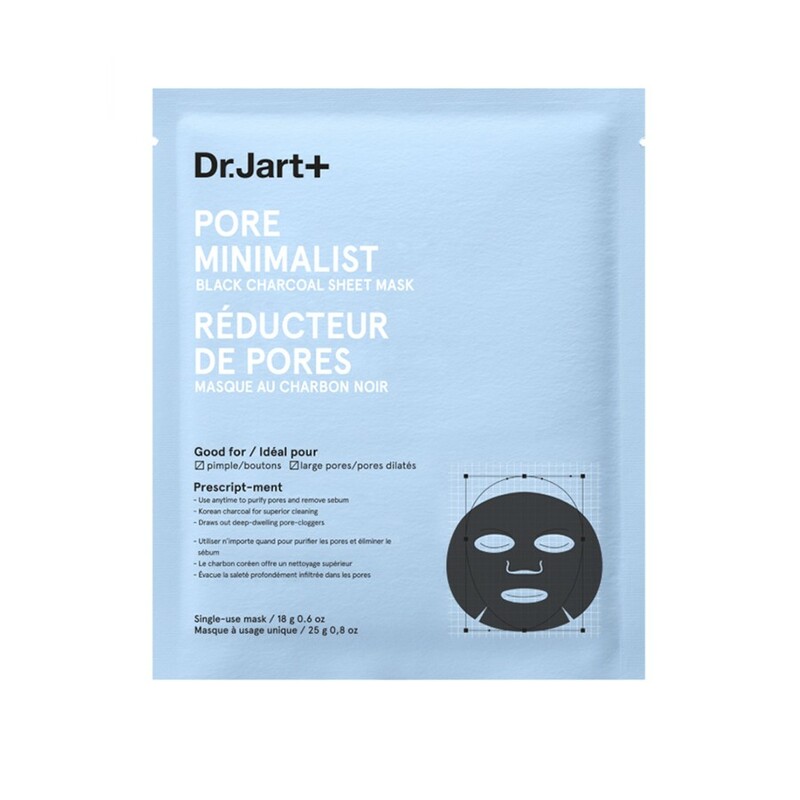 At $8 a mask (if you buy a box of 5 for $40), it’s similar to a Dr. Jart+ sheet mask, but I like it better than Dr. Jart+. I believe this is a microfiber mask — it’s soft and folded into itself, but not as thin (and unwieldy to handle) as a cupro mask. It’s pitch black so prepare to scare the bejeezus out of everyone in your household. The essence is watery with a slight viscosity, and there’s a lot of it. Unfortunately, I notice too late that it contains alcohol. Boo! I generally try to stay away from products with alcohol in it ever since Paula Begoun scared me into swearing off the stuff (at least in my skincare. Ha, hardly anyone would ever be able to make me give up my happy hour glass of wine!). Thankfully, there’s no alcohol smell like there is with other products containing alcohol. After 20 minutes, my face felt comfortable and not at all dried out. In fact, because the mask is black, you can actually see the areas of the mask that are still wet (mainly on the cheeks — the rest of my face apparently soaked up the essence). Afterwards, as I patted in the essence, it absorbed quickly and played well with my other serums and moisturizers. No pilling on the neck — always a make-or-break situation for me. My face felt soft, comfortable, just the way it should after a good face mask. $7.50 for one at Sephora. For a Korean brand, they do sure make a lackluster sheet mask. This is a basic cotton mask with a less than impressive fit. Extra notches along the jawline make it extra awkward to place on the face, though I’m sure they meant it to result in a better fit. Alas, the fit is pretty horrible — the eye sockets are gigantic, resulting in no coverage in my desperately needed under-eye area. There’s way too much mask on the vertical edges of the mask, and the flap covering the nose is tiny, while the gap between the nose flap and cheeks results in wide swaths of cheek left uncovered. I moved everything in towards my nose, but the cloth just bunched and folded. The essence felt like nothing, practically like water, and there was nothing but moisture along the inner pouch — hardly anything to tap on top of the mask, much less on my hands and neck. After 15 minutes, when I patted it in, I was surprised that the essence felt much more viscous on my face than it did in the pouch, if a little sticky. It played well with others, not pilling as I patted on the rest of my skincare on top. It’s a basic sheet mask that I felt was lackluster if not terrible. I’d use it again if it were free, but only on days when I needed to slap something on and not when I really needed some serious skincare. At $14.95 for three (about $4.99 for one), it’s not bad, but for the price, I’d rather get my favorite LJH Tea Tree Soothing Mask for the same price. 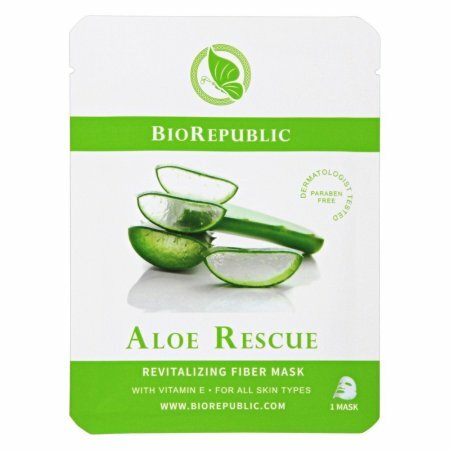 What are some of your favorite sheet masks?